Thank you so much for helping us achieve what we wanted we are 100% satisfied. Fit for a luxurious queen’s table, this pair of velvet oval dining chairs makes any dinner into a textured, sensual affair. Each of these French country chairs features rich, soft upholstery in a lovely champagne beige tone. 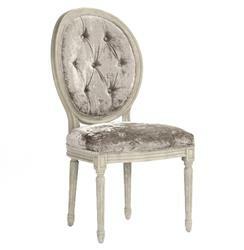 A distressed taupe finish on the chair’s oak base gives them an antique, old world feel. Item sold as a pair.